The Itty Bitty Kitty Committee: Thank You, Santa! It's just what I wanted! A Walter under my tree!! How did you know? Not to be greedy,, but where's Ira? Must be in my stocking. He's not in that box, is he? look up...he's up the tree! You must have been really really good this year to get such cuties!!! Merry Christmas to you and your family and those 2 cuties !! Oh, Charlene, you were a VERY good girl! Eeee, perspective shot! If there's one thing I adore, it's photos that show how tiny these itty bitty kitties really are. Best yet -- kittens with very round tummies! Look that that roly-poly tummy!! And the pipecleaner tail!! Couldn't ask for anything better!!!! Where is Ira hiding..under the blanket or in the tree!!! Merry Christmas!!! @anonymous..am wishing for you a very Merry Christmas and a 5'10" guy with the brown hair and hazel eyes!!!! What better gift could there be on Christmas....but baby kitties. So precious. What a sweet kitty. I bet Santa left you a treat. 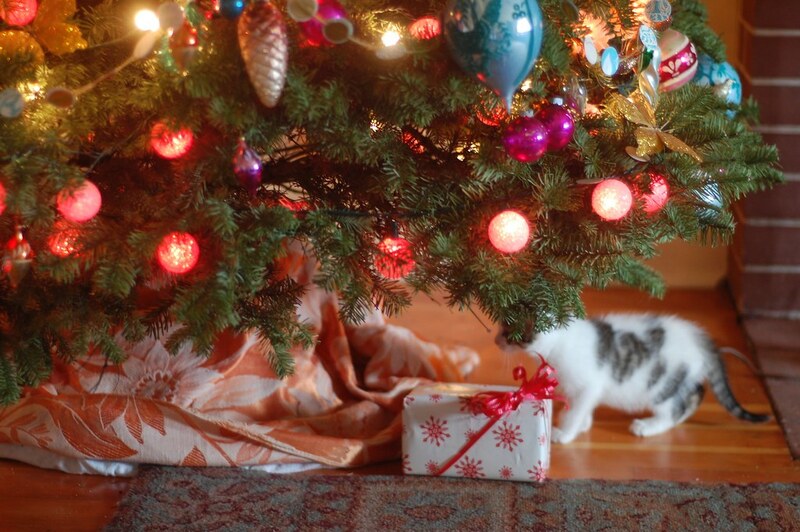 The best gift under the tree! Merry Christmas to all my fellow IBKC followers and, of course, THE IBKC!!!! Who would have been under my tree if I had put it up this year? Hmmm - I will just enjoy IBKC's and the impending Charlene+Finch Brothers photos. Happy Christmas! It is so nice to see the little Finches so nice and fat! Merry Christmas, IBKC. Charlene, I hope Santa Paws brought you and your family everything you were hoping for and more.